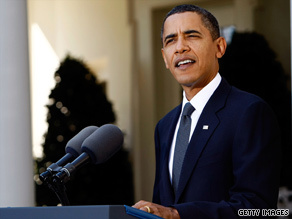 President Obama speaks about his Nobel award at the White House on Friday. We cannot accept the growing threat posed by climate change, which could forever damage the world that we pass on to our children -- sowing conflict and famine; destroying coastlines and emptying cities. And that's why all nations must now accept their share of responsibility for transforming the way that we use energy. We can't allow the differences between peoples to define the way that we see one another, and that's why we must pursue a new beginning among people of different faiths and races and religions; one based upon mutual interest and mutual respect. And even as we strive to seek a world in which conflicts are resolved peacefully and prosperity is widely shared, we have to confront the world as we know it today. I am the commander-in-chief of a country that's responsible for ending a war and working in another theater to confront a ruthless adversary that directly threatens the American people and our allies. I'm also aware that we are dealing with the impact of a global economic crisis that has left millions of Americans looking for work. These are concerns that I confront every day on behalf of the American people. That has always been the cause of America. That's why the world has always looked to America. And that's why I believe America will continue to lead. Thank you very much.